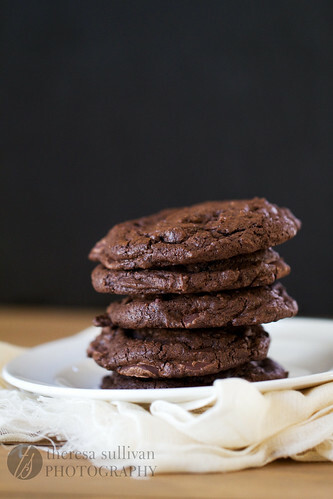 I’ve been looking for a decadent, extra chocolate-y cookie for a while now and good news: I think I’ve found it. I wanted a cookie packed with the maximum amount of chocolate allowed by law. I wanted a cookie so rich and fudgy I would be satisfied with one, but would eat two anyway because they’re that good. I baked these cookies to share with friends and family. I love making people happy through baked goods, but I’ve got to be honest here – I immediately regretted giving them all away. I should have kept them all for myself! Fortunately they’re easy to make and believe me, I have plans to make more very soon. = a chocolate overdose in the best possible way. They’re a little chewy on the outside, but the inside stays dark and moist, almost like brownie batter. These cookies are so packed with chocolate they probably should be illegal. Lucky for you, they’re not! Preheat oven to 325°F. Line 2 baking sheets with Silpats or parchment paper. Whisk together flour, cocoa powders, baking soda and salt in a small bowl. In a small saucepan, melt butter and chopped bittersweet chocolate over low heat, stirring frequently. Remove from heat. Stir in vanilla. In the bowl of a stand mixer, beat eggs and sugar at medium speed until light yellow in color and satiny, about 3-4 minutes. With the mixer on low speed, slowly pour in chocolate mixture and mix until well combined. Add flour mixture and beat on low just until incorporated. Fold in the chocolate chips by hand with a spatula. Scoop out dough with a 2 tablespoon cookie scoop and place 2-inches apart on prepared baking sheets. Bake at 325°F for 12 – 13 minutes. (The outside will be set but the centers should still be soft and slightly under-baked.) Cool on baking sheet for 3-5 minutes, then transfer to wire rack to cool completely. Store at room temperature in an airtight container. Best enjoyed within one week. I’m glad I was able to snag one of these cookies from you before your regret kicked in! They were so chocolatey and delicious! These definitely look like brownies in cookie form, they have that shiny, crackly on top that the best brownies have! I bet they’d also be really good if you substituted peanut butter chips for the chocolate chips. yummmmm yumyumyum these look amazing! that last picture with the melty gooey chocolate chip is awesome!!!! They look amazingly rich and fudgy! This looks like the perfect recipe for me to try, I, too, am a chocolate lover! If you didn’t mention that your second bath of cookies you’ll make will be just for you, I would’ve asked you to mail some my way! ;) By the way, did you know that yesterday was National Brownie Day? 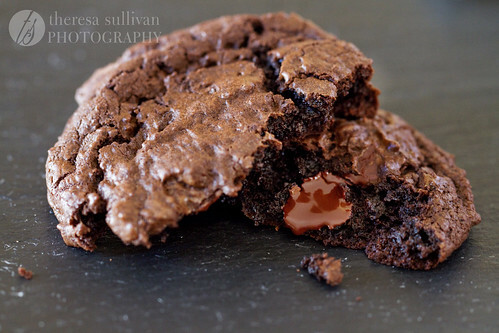 Also, they look so brownie-like and oooohhhh …… the melted glossy chocolate chip oozing out of cookie ……. And in that third picture, the interior just looks so dark and glorious! 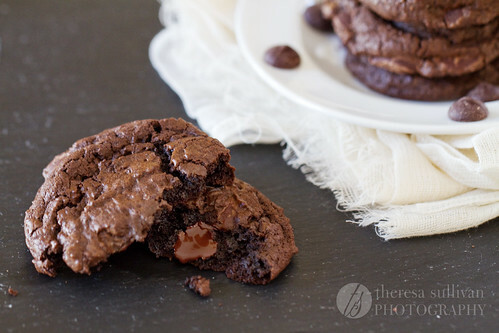 I can’t help but imagine these Fudgy Triple Chocolate Bliss Cookies melt in my mouth! My eyes opened wide when i read the title of this post! Really sorry to sound like an obsessed freak with these cookies, I can’t help it! Just made these with my sister… Delicious! They will definitely be made many times. Bliss indeed! Best fudgy chocolate cookie I have ever made! It came out to be the perfect chewy/fudgy texture, especially next-day. I also experimented with adding some orange zest – so good!